In the battle for the best garage door opener, it's Chamberlain vs. Genie. Belt-drive garage door openers are known for their whisper-quiet operation. The trade-off is higher prices compared to chain drive garage door openers, which we cover elsewhere in this report. Still, if your house has an attached garage, and the noise of a chain-drive model will disturb your peace and quiet more than you'd like, you might consider that trade well worth making. For this round of the Chamberlain vs Genie battle for the title of Best Reviewed belt-drive openers we are going to give the crown to the Chamberlain B970 (Est. $240), but it was a close call. The B970 is Chamberlain's top-of-the-line belt-driven opener, and looks to be more or less identical to the also very popular (but now discontinued) Chamberlain WD1000WF, last year's Best Reviewed choice. On the features front, the Chamberlain B970 is one of the most well-equipped garage door openers we spotted. It's powered by a 1.25 HPS (horse power similar -- see the buying guide for more info on what that spec means) motor, the most powerful that the company offers It's MyQ enabled, and the required internet gateway to gain smartphone and tablet control and status updates is included. MyQ technology draws the lion's share of positive feedback from users and experts that have installed and/or tested it. For example, Wirecutter looks at the Chamberlain MyQ Garage (Est. $100), an aftermarket product to add the MyQ controller and gateway to an existing compatible garage door opener (the same one that's already built into the B970), and comes away impressed. "If you are looking for a way to control your garage door remotely and check on its status, and would like integration with major smart-home systems such as HomeKit, Wink, IFTTT, and Google, the MyQ Garage is the best option." It's also HomeLink compatible for cars that have HomeLink remotes built into their vehicles. However, as noted in the introduction, compatibility with some cars, especially older cars, requires the purchase of an optional HomeLink Compatibility Bridge (Est. $25). There's a battery back-up in case of a power outage. There are safety sensors that will halt a closing garage door and reverse its motion if anything -- such as a person or a vehicle -- breaks its invisible beam. The full function in-garage wall control panel displays diagnostic information to help with troubleshooting should something go wrong, along with things like time and date. Also included are two multifunction remotes for your cars, with a range of up to 1,500 feet, and a wireless external keyless entry system. The system uses a rolling code with 100 billion options, and that code changes after every use for greater security. Two 100-watt lights (bulbs sold separately) provide plenty of interior illumination. Expert reviews, save for the MyQ technology part of the garage door opener, are hard to come by. PCMag and CNET install and test the also-discontinued Chamberlain HD950WF, a Home Depot version of the previous generation Chamberlain WD1000WF, and come away mostly impressed. We say mostly because, as we see in feedback for virtually all garage door openers, installation can be vexing for the home-improvement novice. "I can't stress enough that upgrading your garage door opener is not a task to take lightly," says CNET's Brian Bennett. Other aspects of the Chamberlain belt-drive garage door opener are more smile-inducing these reviews say. Once installed, no performance shortcomings are observed. The smart features are well received, with PCMag's John R. Delaney saying that the apps (both Android and iOS are supported) aren't flashy, but are easy to use. Fortunately, user feedback is fairly ample. The biggest accumulation is at Home Depot, where more than 700 owners have weighed in on the B970 (as well as the very similar previous versions). Satisfaction is largely positive, and the belt-drive opener earns a rating of 4.5 stars. While most users are pleased, others grouse about connectivity issues, issues with HomeLink compatibility, and installation challenges. Another complaint is that if you want to link MyQ with your Google or IFTTT account, there's charge of $1 per month, or $10 per year. But while the Chamberlain B970 takes the best overall title, Genie comes out on top in the Genie vs. Chamberlain battle in the value category, and we saw some outstanding user reviews for the Genie SilentMax 750 (Est. $180). It's not as powerful as B970, but the .75 HPc (horse power comparable; again, see the buying guide for more information on what that means) motor is still powerful enough to open even heavy residential garage doors with little strain. It's also feature-packed, with two pre-programmed vehicle remotes, a multifunction interior wall controller, a wireless entry pad, rolling security codes and safety sensors. It's not Internet capable out of the box, but that functionality can be added via the optional Genie Aladdin Connect module (Est. $95). Aladdin Connect gets pretty good feedback from users, but it's less versatile than MyQ, with support only for its proprietary App and Iris by Lowe's smart home system. The SilentMax 750 is also HomeLink and Car2U compatible, but there's no battery back-up. Reviews say that getting HomeLink to pair with the Genie SilentMax 750 opener can be a challenge, but overall we saw far fewer complaints about getting HomeLink to work than we did with Chamberlain garage door openers such as the B970. Like the Chamberlain opener, feedback on installation is mixed. Many say it's a snap, others it's anything but. Some older reviews criticize the instructions as well, but newer feedback tends to credit them with being clear and helpful, so we suspect Genie has made an improvement in that regard. Either way, most owners are happy. Home Depot, which is the primary retailer for the SilentMax 750, hosts nearly 1,000 owner reviews, with an impressive 99 percent giving it a recommendation. Overall, it earns a score of 4.8 stars. Genie also offers a pair of step-up models that are worth considering. The Genie StealthDrive 750 Plus (Est. $240) offers a more powerful 1.25 HPc motor (the same as in the Chamberlain B970), adds a battery backup, and includes Aladdin Connect. The feature line up is otherwise similar to the SilentMax 750, as is satisfaction at Home Depot (the primary seller we saw selling this model at the time of the report), but that's based on far fewer reviews (just under 85). Still 97 percent of owners recommend it, and it earns a 4.8 star rating. If you don't care about smart features, the Genie StealthDrive 750 (Est. $190) has everything you'll find in the Genie StealthDrive 750 Plus except for the built-in Aladdin Connect module. Feedback is a little bit behind the other Genie openers, but still pretty good at 4.5 stars based on nearly 150 reviews at Lowe's (the primary retailer for this model), with recommendations from 94 percent of owners. Chain-drive garage door openers are less expensive than equivalent belt-drive openers -- but they have a reputation for being much noisier, and for many that's a deal killer. However, reviews say that many current chain drive models actually hold their own against belt-drive models, and in some settings, such as a detached garage, noise isn't all that big a factor. For those looking for a well-featured chain-drive opener for a typical residential garage door at an attractive price, the Chamberlain C410 (Est. $160) looks like a top choice. This is the successor model to last year's Best Reviewed pick, the Chamberlain PD612EV, a 1/2-horsepower (equivalent) opener that developed a good reputation for being reliable and feature packed. The C410 looks to be very similar to the PD612EV, and initial feedback, while still limited, looks to be every bit as good. That's not to say that complaints are unheard of, but as is the norm with many garage door openers, most have to do with issues regarding HomeLink compatibility (see the introduction for more about that). A handful also grouse about not understanding that while the C410 has MyQ compatibility built in, you need to buy the optional Chamberlain MYQ-G0303-SP MyQ Home Bridge (Est. $70) Internet gateway to gain smartphone control of the opener. Shipping issues, such as parts being missing, also crop up from time to time. On the plus side, the above comments notwithstanding, most owners give installation ease a thumbs-up, and especially praise value. In addition, while (as noted) chain-drive openers are usually panned for noise -- and the C410 doesn't entirely escape such criticism -- many owners are surprised by its relatively quiet operation. The Chamberlain C410 comes with a full line-up of features, especially considering its price point. As noted, this garage door opener has Chamberlain MyQ compatibility built-in. Other features include two multifunction car remote controls; a multifunction wall-mounted control; a keyless-entry exterior keypad; and safety sensors that project an invisible beam that, if broken while the door is closing, will stop and reverse motion. The C410 also uses a rolling security code that changes every time you use the remote for added protection against break-ins. There's no battery back-up, but a manual emergency release handle allows the garage door to be opened or closed in the event of a power failure. The big thing missing from the C410, of course, is out-of-the-box Internet connectivity. 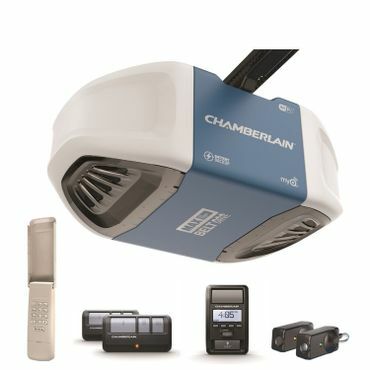 If having your garage door opener as part of your smart home system, and having it controllable via a smartphone app, are high on your must have list, the step-up Chamberlain C450 (Est. $180) is almost a no-brainer. It's identical to the C410 but includes the gateway that's an option on the C410. The only thing keeping it out of the top spot among chain-drive garage door openers is that feedback, while very good as well, is even more limited than for the C410 -- we spotted fewer than 20 reviews altogether. DIY or hire and installer? All of the Chamberlain and Genie garage door openers discussed above are intended for the DIY market. However users and lots of experts say that installing a garage door opener can be quite a challenge for a typical homeowner. That said, if you have the skills and the expertise to tackle more advanced home handyman jobs, you should be able to successfully install most garage door openers -- though perhaps not without a little bit of frustration along the way. If self-installation is a bit more than you care to -- or are realistically able to -- tackle, Chamberlain-made garage door openers are available in LiftMaster versions, which are sold through professional installers. Specs and features will vary somewhat, but an installer can work with you in matching up a model to your needs and budget. You can find local installers at the LiftMaster site. Likewise, Genie makes a separate line of openers designed for professional installers, and you can find a local Genie pro via the Genie web site.